Two year bans certainly haven't cut the mustard in terms of beating the cheats. Has the time come for lifetime bans? Former Olympic heptathlon champion Denise Lewis and anti-doping guru Michele Verroken are just two of the growing number of voices who have called for the tougher sanction after the revelations of the last few days. But would lifetime bans really mean we can go on living our lives in a world free of cheats? Please excuse me while I laugh into my bottle of sports recovery supplement. 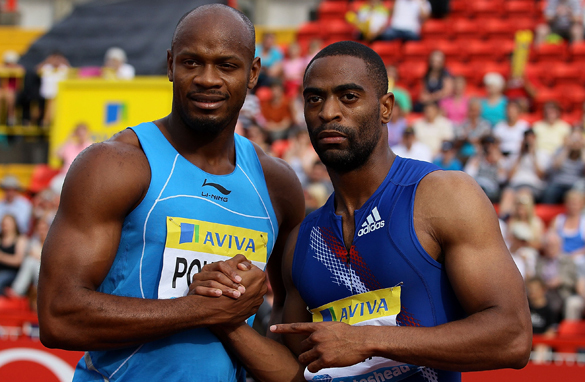 With the news of positive samples for Tyson Gay, Asafa Powell and Sherone Simpson has come a sharp wake up call, although all three deny intentionally doping. These are not no-names struggling to rub together a crust. These are athletes at the top of their game - with their names at the top of the leaderboards. Four of last year’s Olympic men’s 100m finalists are now tainted by doping scandals. As well as Gay and Powell, bronze medallist Justin Gatlin has twice been banned for doping, while runner-up Yohan Blake served a three-month ban in 2009. We thought - maybe just hoped - that we were winning the fight. The London Olympics was heralded as a major step in the right direction – with new relationships between drugs companies and anti-doping authorities, and more tests for the right things. But sadly the odds are still – and will always be – stacked in favour of the cheats. Yes, there has been massive progress with the biological passport and the Adams whereabouts testing scheme. But the cheats will always be one step ahead. It's the age old problem – the testers can only test for what they know about. Many of the current bans are just about long enough to go and get your hair done. Offenders can be back in the game in time to try the latest drugs before the testers have even worked out how to spell them. At least lifetime bans would mean one strike and you’re out. And those doing things the right way will be given, if not a level playing field, one that’s a little less bumpy. You can’t escape the fact that there will always be those who bend the rules to succeed. It’s the same in all aspects of society. And in sport – the rewards will continue to outweigh the risks. Big money sponsorship deals with the likes of Nike, Omega, Lucozade, and Adidas have followed Gay and Powell’s success on the track. Adidas have certainly been quick off the blocks to drop Gay in the wake of this failed test. For all the testing and talk of change – there will always be those who cheat. But it’s the widespread acceptance that is most worrying. Five Jamaican athletes on the same team at the same meeting, all linked to positive test results, is not a one-off case. The parallels with where cycling was 15 years ago are frightening, “everyone else is doing it, so I’m just keeping pace”. One or two athletes and former athletes speaking out every time there’s a positive test isn’t going to change the sport. It needs self-regulation from everyone – and needs the athletes, coaches, trainers, and managers to buy into a new attitude – a new system and mindset to move things on. Without that, no ban will be tough enough to beat the cheats. It's sad...why shouldn't they use their energy to to win medals? There are more,they should be banned for life.